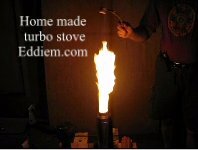 Eddie's cheap, easy to build, turbo stove. It isn't rocket science – it just looks that way. I didn't invent the turbo-stove, nor have I perfected it. I have just come up with a very easy way to make them. Very few people will have heard about turbo-stoves before. 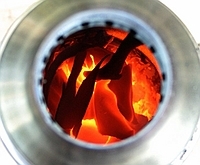 A turbo-stove uses gasification and combustion of the gases produced to achieve clean efficient use of a fuel such as wood. Essentially we have a chamber containing a smoky fire and a secondary flame which burns the smoke. Almost all natural fuels and many synthetic ones will burn very cleanly under the right conditions. 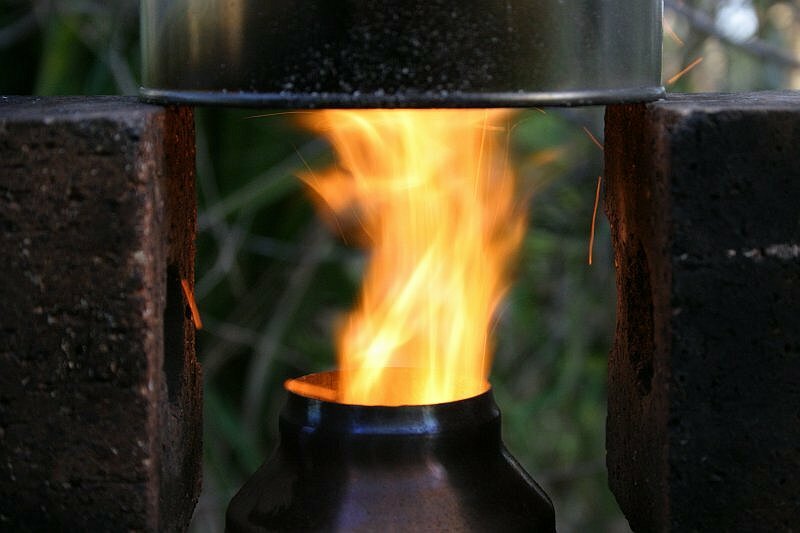 A properly functioning turbo-stove burns wood and most other bio-fuels so cleanly that they can be used indoors without a chimney. 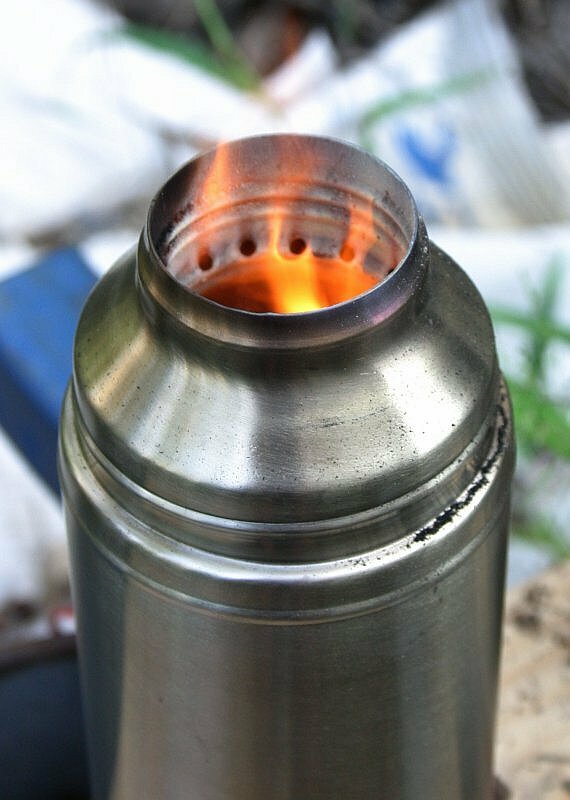 They can be used for cooking in a similar manner to a gas flame. 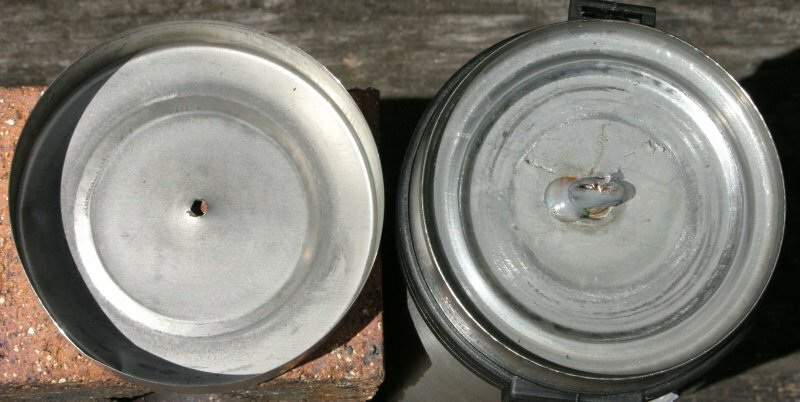 Turbo stoves can be divided into two types. They are either fan forced or use natural convection. Mine is of the fan forced variety. Nobody would go to the trouble and expense of adding a fan if it wasn't necessary but unfortunately my small stove doesn't work well without one. The stoves can be made in many ways. 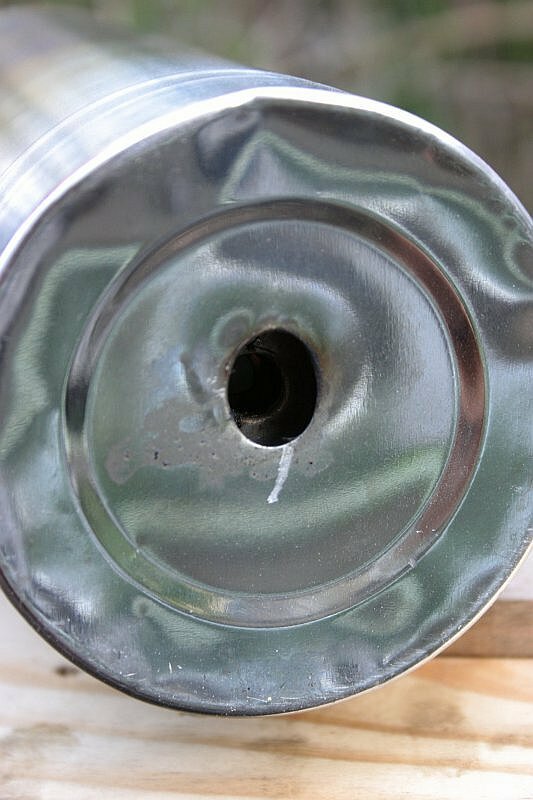 A cheap way is to use discarded tins but to make something that will last needs something less prone to rusting such as stainless steel. I had no idea how these flasks are constructed. I would not have been surprised to find they weren't really vacuum flasks at all but they are. I think they are quite well made for the price. I paid $14.99 au$ from “Crazy Clarke”. It wasn't till I made stove number three that I discovered the bottom is a press fitted cap. I wanted to make it as simple as possible and then tweak things till the stove worked. 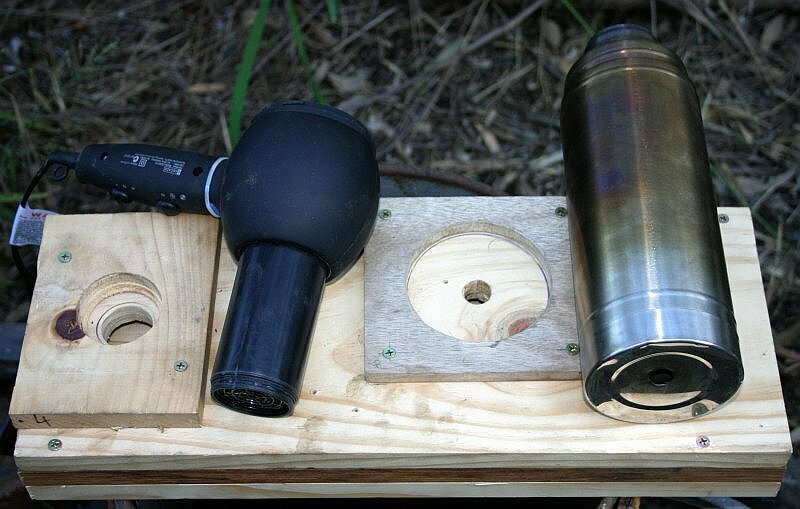 When I drill a hole through the centre of the bottom I hit a copper tube and the drill wandered and made a mess of the outer hole. The end cap is difficult to remove. Here I've drilled a small hole in the cap and popped it off with compressed air to show the innards. I simply drilled a 6mm hole through the three layers of metal to provide air to the combustion chamber. The hole was enlarged to approximately 12 mm for the outer two layers. 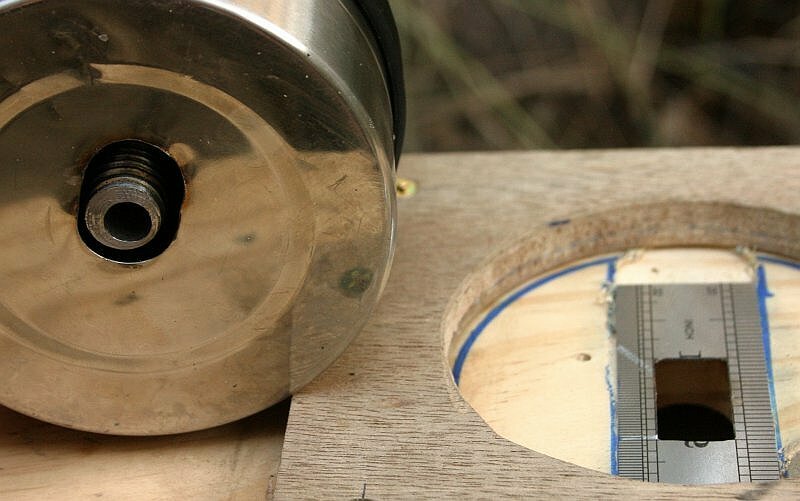 To supply air to the secondary (top) flame, 16 – 3 mm holes were drilled along the groove where the rubber seal on the stopper would normally rest. The size and number of holes doesn't seem to be too critical. I didn't really expect the stove to work first go. I assumed I'd have to adjust the hole sizes and add some sort of air-flow control first. I tried it the way it was to see what would happen. The first test was in my kitchen without any fan forcing. For fuel I used newspaper. The kitchen rapidly filled with smoke. I let it burn and quickly organized a blower. Holding the flask in my left hand (warm at this stage but not hot) I held the blower to the hole in the bottom. 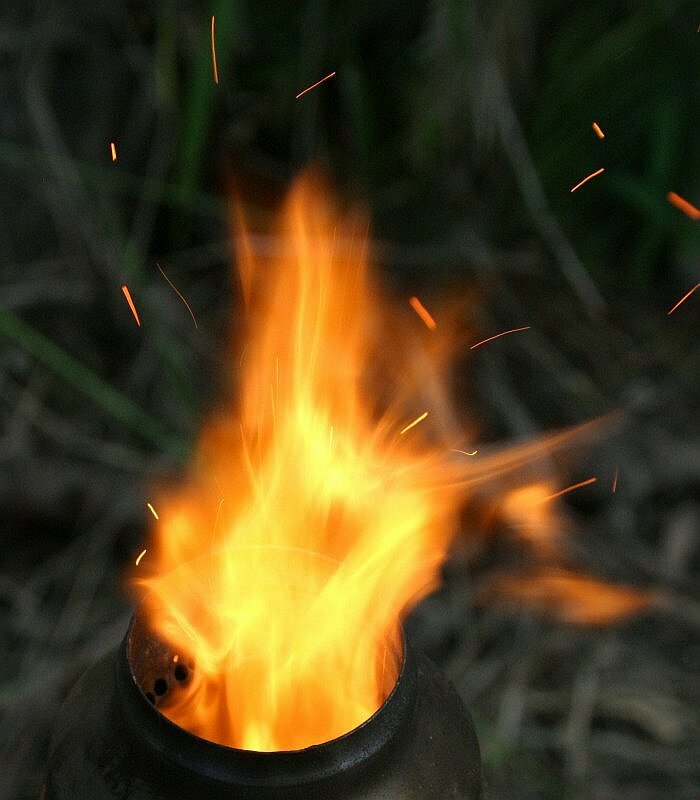 As soon as the blower came close to the hole the flame flared up – the smoke ignited and a smokeless flame some 400mm long leapt from the flask. This was accompanied by a soft roar like a jet engine. Beginners luck or not it seemed to work. The size of the flame was unexpected, I thought it would be much smaller. The flask then became too hot to hold. It was still morning and I waited till later late afternoon for further testing. Queensland in mid summer is not good for playing with fire. The blower I'd used was an 12 V air-bed inflater I'd bought from K-Mart for $18. I powered it from a small battery charger. The ideal fan is probably a small impeller type. Axial flow fans work but I think they need more power than a well sized impeller would. I tried a PC cooling fan (axial) but it didn't have enough pressure (later - feb 21'st- I got it to work). I'm sure one of the more extreme PC fans will work will probably draw close to 10 watts. I found a hair drier (with the heater off!!) works fine but sometimes has too much airflow even on the low speed setting. My test bed for the stove components is a simple shallow box made of wood. I can easily try different blowers and burners. Air is blown in through a hole and comes out again under the burner. The bottom of the stove does not get hot enough the scorch the wood and as yet no coals have fallen out through the bottom. Obviously something fireproof would be safer. For now some bricks will do as a billy stand. I found that having the billy too close doesn't work well. If there isn't enough height for the flame to burn properly the flame will smoke. The same thing happens if a fine mesh is placed over the flame. This flame is from saw dust. Normally saw dust is quite difficult to burn cleanly. I used a core of paper to allow the air to flow. This was packed tightly with saw dust from my shed floor. This was very low quality stuff, it was old and dirty but burned very nicely. 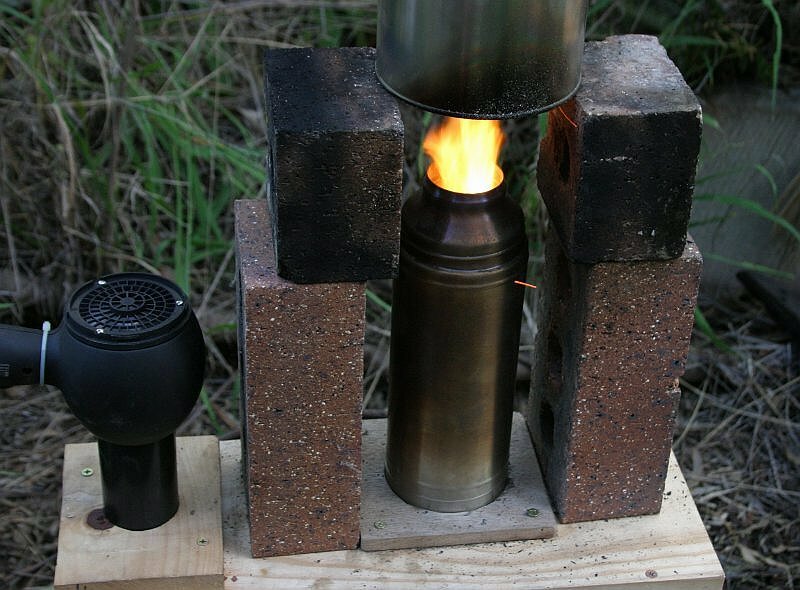 For version two of the burner I bored out a steel bolt and drilled seven smaller holes into the head to join the larger hole. The end of the bolt is reasonably flush with the end-cap. When this sits on top of the modified steel ruler - I have some control over the ratio of air flowing into the chamber and that to the top. I've burnt a lot of different fuels. Wood is excellent but almost any dry vegetable matter will work. I've also tried a number of plastics. HDPE and LDPE (recycle code 2 and 4) burn clean as you would expect. These burn clean in free air too but in the stove I didn't notice the “plastic” smell they usually give off. PETE (code 1) and Polystyrene foam produced foul black smoke as usual. Ideally plastics should be recycled but if not PE might be better used as fuel than buried in landfill - there are arguments for and against. For most people, I see the stove more as an educational tool than a practical cooking device. 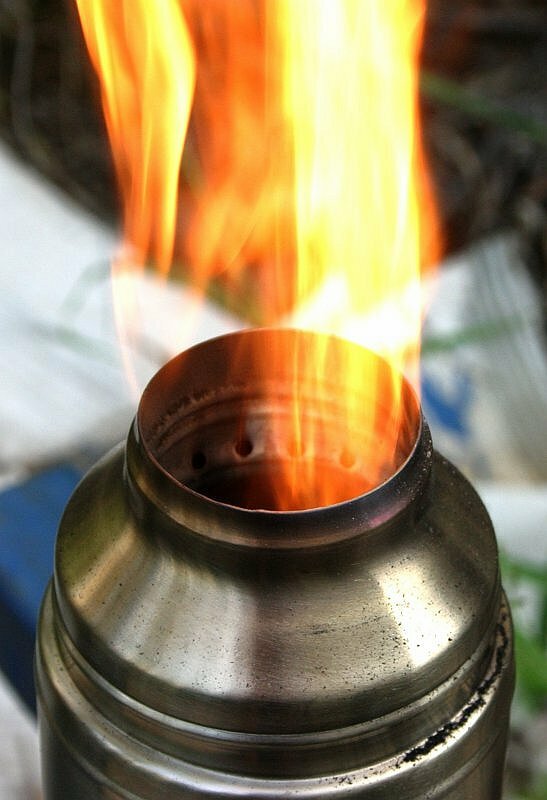 For those of us who would like to be as self-sufficient as possible a turbo stove in definitely worth a look. In places where people rely of fire for cooking or heating an improved stove can make a huge difference to the quality of life – see the reap-canada link for a good example. 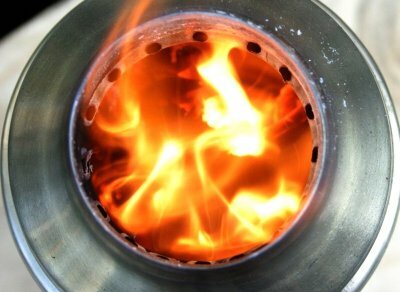 Not only does the stove save fuel but also it reduces health problems due to exposure to smoke. For third world use the turbo stove would ideally use natural convection as the fan adds expense and requires a power source. I've tried to make a version without the fan but haven't been able to make one work reliably. It works quite well with a small (500mm) chimney but this would make it less useful. It would be better just to use a bigger stove. In the modern world many people, myself included, have solid fuel (wood) stoves for space heating. These are mostly quite dirty and cause pollution and health problems to the point where many councils have banned them. A clean burning stove would be of great benefit here. My stove design is fairly well suited to cooking but if you were making a space heater, incinerator or metal furnace you would probably alter the design. For the latter uses you'd probably try to extract heat from the exhaust to preheat the air for the main chamber. I also haven't been able to get a reliable flame in the charcoal phase of the burn cycle. This is where carbon mono-oxide should be produced by the gasifier. I think it might just be too small to work properly. I do get a CO flame but it tends to peter out leaving a glowing coal bed but no top flame. Breakthrough - Mach four works happily on 1.4 watts – see page two. The stoves can melt brass but my turbo-furnace is much hotter. This project is continued on one of my wikis . These AVIs are DIVX encoded.